Eventually Dirty Deeds were signed as the first act on Beast Records, the label created and owned by Harris and Maiden manager Rod Smallwood. The signing was not just an academic or financial arrangement on Harris' part; indeed, as was evident when Dirty Deeds opened its first ever tour of the US as the support act for Maiden's '98 tour, Harris' interest in this band is a passion. 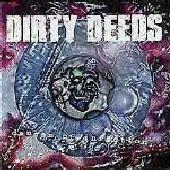 But despite the American buzz interest generated by that tour, neither Dirty Deed's debut, "Danger of Infection," nor their newest effort, "Real World," was released Stateside until now. Apparently the releases are timed to coincide with an imminent second US tour this summer. However, for those of us who have seen Dirty Deeds live, or those who have already scored import copies of the CDs, it is immediately obvious what Harris--and others like him--see in this band. Without being imitative, but rather new-fangled derivative, songs such as "Danger of Infection's" "In The Name of the Law," "Nothing to Lose," and "Promised Land," and "Real World's" "Nightmare," "Hell On Earth," "Judgement Day," and "Welcome to the Real World," all offer power rock's classic ingredients: Fast, aggressive, driven rhythms; strong, snarling vocals; tight, harmonic, blistering riffs; and dynamic time changes. This is authentic, authoritative stuff, true to the spirit, without the pomp, pretension, and self-absorbed posing (as so often can be seen in its various American hybrids.) Take note, too, all you musicians out there, that the performances on these CDs, from the guitars to the bass and drums, are truly first class. Of the two, "Danger of Infection" is arguably the more highly "produced." (Nigel Green, who has AC/DC, Def Leppard, and Iron Maiden as past clients, mixed while Steve Harris served as "Executive Producer.") However, "Real World," the debut production effort of Maiden's longtime soundman Doug Hall, has a more--delightfully--raw edge. As might be expected, the material on both CDs is written with the stage at heart. I gave neither of these two CDs four guitarsaws, however, because I know Dirty Deeds has not yet reached its maximum musical maturity. There is no substitute for the sustained touring that always primes a band like this one into a real champion. Thus, I have no doubt that Dirty Deed's best work is ahead of them. Indeed, perhaps the thing that doesn't -- and can't -- come across on these CDs is how maniacally FUN these guys are to see and hear live. And, gawd, don'tcha love (miss) that insane, English tongue-in cheek humor!? (See RW's "Cyberbabe," et al.) As might be expected, some of the subject matter appears dark, disillusioned, and apocalyptic, but Dirty Deeds, onstage or off, are, in fact, hyper-energetic cutups who give you the impression that they will damn well be having a BALL---all the way to the funeral! Has in-your-face, muscled and tight English hard rock/heavy metal, which Dirty Deeds epitomize, ever been mainstream "fashionable"? Would it really be ours anymore if it were? America, this is the Real thing, get ready to assume the position! Dirty Deeds are: Pete Franklin (Lead Vocals/Rhythm Guitar), Tony Newton (Bass/Backing Vocals); Barry Fitzgibbon (Lead Guitar/Backing Vocals); and Dave Cavill (Drums/Percussion).